« Grab a Partner and Start Stretching with Partner Yoga! 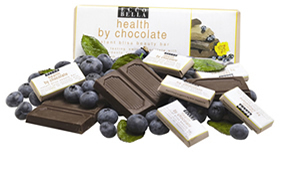 “Healthy” Chocolate Bars-Can it Be? Many Working Well Massage clients try to eat well and exercise. But they do love their chocolate! Can you eat chocolate and still feel you are eating healthy? Can you satisfy your chocolate cravings and still keep your fat and sugar intake to a healthy amount? “Good Morning America” contributor Dr. David Katz has been conducting a study at Yale University on the health effects of chocolate. The Yale study, which is funded by Hershey, used ultrasound technology and sophisticated measurements to assess the effects of eating dark chocolate on 45 moderately overweight adults. The study also measured participants’ blood pressure before and two hours after eating two servings of dark chocolate. Sure enough, after consuming the dark chocolate, which is high in antioxidants, their blood pressure dropped. Dark chocolate also helps blood vessels dilate which allows blood to flow more freely. But that does not mean everyone can consume as much dark chocolate as they want? 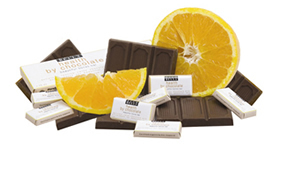 People should look for chocolate that has a cocoa content of 60 percent or higher, Katz said. Katz said that “healthy” candy bars are example of “functional foods.” The manufacturers purposely added a healthy nutrient to the product. He said he expects more similar items in the future. 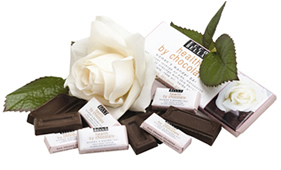 read more from Dr. Katz about “healthy” chocolate bars here. What’s So Healthy About Health By Chocolate Bars? • Each of Beautiful Bones serving (2 squares 16.66gr.) contains 400 mg calcium (38% RDA), 22 mcg vitamin K blend with K2 (from natto, a fermented soybean- no official RDA but suggested RDA is 45mcg), 150iu vitamin D2 (from yeast), 150 iu vitamin D3 (from lanolin- 15% of RDA), 750 mg fructooligosaccharide fiber (from sugar cane fiber- 2% of RDA). • Calcium in the Beautiful Bones Bar is produced from seaweed with its trace minerals intact, such as magnesium, iodine, boron, and selenium. The seaweed is harvested from the seabed off the west coast of Ireland from mineral rich Atlantic waters. • Woman’s Wonder Bars includes a traditional herb, Chaste Tree Berry, which is considered safe and effective for relieving symptoms of both PMS and menopause. According to the German Commission E monograph, the ripened berry of the Chaste Tree was clinically proven to relieve PMS symptoms and reduce menopausal symptoms. Research shows that recommended dosages vary from 40 mg day to 400 mg day without side effects, except for a slight skin itching. It is not recommended for pregnant women. • Whole soybean powder contains the isoflavones genistein and daidzein. According to the HealthByChocolate website, some studies show that isoflavones have the ability to mimic human estrogen, helping to reduce insomnia, loss of libido, night sweats and hot flashes. Isoflavones also have a positive effect on bone, breast and heart health. • Cranberry Seed Oil has a blend of omega 3/6/9 essential fatty acids that are beneficial to skin, heart, brain and overall cellular health. Omega 3 essential fatty acids help relieve inflammation, a major factor in PMS cramping and headaches. • FOS (fructooligosaccharide) is the fibrous part of sugar cane. FOS feeds the good bacteria in the digestive tract. When digestion is optimized, hormone levels are more balanced and calcium absorption increases by 50%! Where Can You Buy Healthy By Chocolate Bars? Whole Foods Market and a host of other retailers here. Or Make Your Own Chocolate Bars! 1. Blend everything in a food processor until very smooth. 2. Pour into your chosen mold (ice cube trays work well). 3. Freeze for 20-30 minutes, and then enjoy! Note: Neither Working Well Massage nor Working Well Resources has any affiliation with Health by Chocolate. We just want our clients to know about options that may be healthier than standard high fructose corn sugar sweetened milk chocolate bars! Additionally, it is essential to remember that, while virgin organic coconut oil is healthy, some of the coconut oil that is purchased in shops could actually have been partially hydrogenated (or at least chemically processed: deodorised, bleached etc). Be sure you only buy organically produced, virgin, non-chemically processed coconut oil!